There’s a current debate amongst journalists about the real estate industry “crafting narratives.” The discussion is taking place amongst divided journalists and activists, and I think the public should be a part of it. Special interest groups have always staged PR events to try and gain coverage, but the real estate industry has decided to take a more “proactive” approach. Some members of the industry are turning regular journalism into “commerce journalism,” by manipulating coverage in their favour, sometimes engaging in unethical practices. 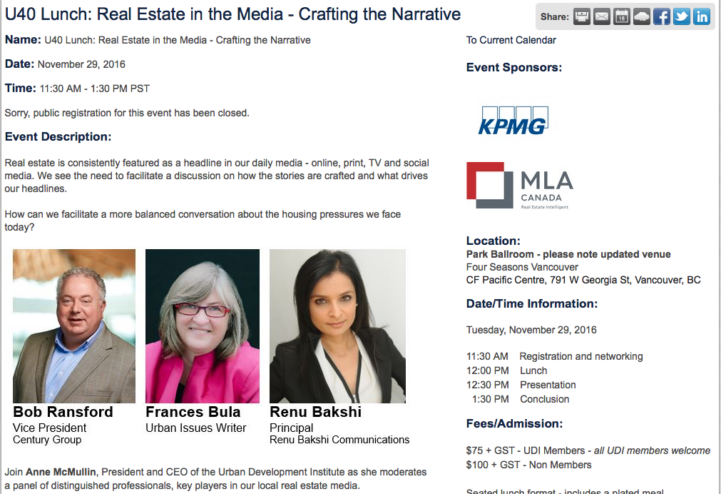 An event by the Urban Development Institute (UDI) called Real Estate In The Media – Crafting The Narrative was held last week. The $100/head luncheon sought to “facilitate a discussion on how the [real estate] stories are crafted” and “examine more proactive opportunities to collaborate with the media.” The primary objective was to help “balance” the coverage that the media provided. Sure, PR people hold these kind of events frequently – that’s normal. SCMP’s Ian Young pointed out the weird part – a well known Globe and Mail journalist was speaking at the event. Now, this doesn’t violate the Globe and Mail’s ethics policy, as long as she isn’t paid. However journalists deal with facts, and those don’t need balancing. A journalist at one of Canada’s larger news outlet was giving advice on how to steer journalism is unethical at best. Ian Young, one of Vancouver’s top journalists questioning the practice on his Twitter. One of the event sponsors has been “crafting the narrative” for a while, and has even got into hot water for it. In 2013 a MAC marketing manager asked two employees to pretend to be “pedestrian traffic” at a condo launch. They did so shortly before a major Canadian news network arrived. The manager has stated that he did not ask them to do anything else, but it did get worse from there. The two were interviewed by the news outlet, and claimed they were sisters from China. They further elaborated that their wealthy Chinese parents were in town to buy them a condo. In actuality, they were just Vancouver natives that were way too comfortable going off script. Although, who can blame them? 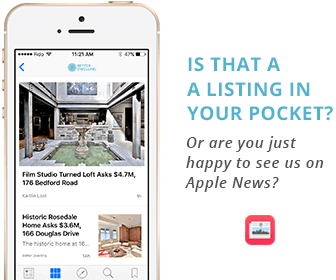 A successful condo presale launch raises millions of dollars in capital. Sure, it’s ethically wrong, and the British Columbia Real Estate Association even dropped the hammer on them with a suspension and fine. Although in my opinion, a 14 day suspension, and $1200 fine isn’t much of a deterrent to not do it again. In fact, it’s probably less than the cost of an ad slot at the major news outlet that was duped. Another method of controlling media coverage has been through threats of legal action. Over the past three months we’ve averaged one threatening email every other week. They come from developers, associations, and even a few billionaires with large real estate holdings. Most back down with a little pushback, especially when asked to explain if the coverage is factually inaccurate. This unfortunately makes it clear that this technique is being used solely for the purposes of intimidation. Attacking journalists through intimidation isn’t generally something tolerated, and with good reason. If journalists are intimidated by the hassle of being sued, they’re less likely to investigate issues of critical importance. Note, I said the hassle, not the financial consequence of being sued. Media outlets can ask the court for reimbursement if everything was factually accurate. However being sued is a long and stressful process, that most would rather avoid. In the circumstances of real estate, I can attest to the fact that a number of journalists from large news outlets have avoided stories because of the potential consequences. This is likely why the same old “everything is great” narrative is so popular. Buying a home doesn’t need a narrative. If you’re buying a house that you can afford, and you actually plan on living in it – you’ll likely live in it long enough that boom and bust cycles of the economy won’t impact you. This is the majority of homeowners, and you don’t need to “balance” that. There’s also an emotional value to buying a home that won’t show up on a balance sheet. This is well worth the premium to a large number of Canadians. If you would experience financial strain to buy a house, you should run the numbers yourself first. Renting isn’t the end of the world, so don’t rush into buying because you think you’ll make a ton of money. American economist and the “father of finance,” Eugene Fama’s Efficient-Market Hypothesis is something you should become familiar with. It states that asset prices reflect the information you have today, including predicted growth. How your asset behaves tomorrow is subject to new information, which may or may not be in your favor. To put it bluntly, no one knows if you’ll make money buying a condo – it’s a guess. You may lose 50%, you might gain 50% – but anyone that tells you with certainty what will happen is pretty much lying. Canadians already have a hard time getting straight facts about real estate. The value of the homes you’re buying is “proprietary,” and only a salesperson can tell you the what it is. Some members of the real estate industry aren’t happy to end the obfuscation there. Instead, they’re resorting to manipulating your only source of non-sales information – journalism. Now there’s nothing legally wrong with that, but you should probably know about it. Like this post? Like us on Facebook to get our next post right in your feed. I remember the CTV covering the condo lineups a few years ago. There should be criminal charges laid for manipulating media that way. Any self-respecting journalist wouldn’t touch that kind of stuff with a ten foot poll. If she was paid, I would just say she was a sellout. I don’t understand why she would do it for no pay however. Gambling your credibility at an event like that is very odd choice. She didn’t do anything illegal, but Ian’s right – it’s not ethical for a news outlet to allow their journalists to help people make news. Ironically, his employer is in China and he thinks this unethical – this should speak volumes about the way Canadian press has been able to get away with this stuff. I’m assuming this is a Trump reference from someone that can barely read. This isn’t a conspiracy where the media is conspiring, it’s three specific events that alter the way news is being covered. If anything, I think it’s saying media should be given more power to investigate. A fundamental part of a democracy is freedom of press, and if press is being coerced through threats – we might as well just fly a yellow star on our flag. Even some real estate agents are getting tired of this crap.